This week’s #BrunchBucketList of the week goes to Styer’s Garden Café at Terrain Glen Mills, a festive and floral indoor/outdoor café greenhouse with fresh cheeses, organically farmed vegetables, all day-errryday brunch that looks, literally, like an Anthropologie catalog come to life. No, really, it actually is. URBN Inc., the company who owns and operates Anthropologie as well as it’s sister companies – Urban Outfitters, Free People and BHLDN round out their offerings with Terrain, comprised of two east coast brick & mortar stores and a fully stocked website merging luxurious home and garden as you’ve come to expect from these stylish styling wizards. 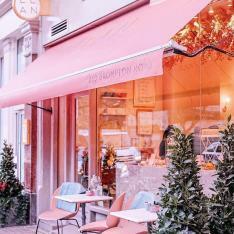 So naturally, they would have an insanely gorgeous and massively Instagrammable antique greenhouse café as swoon-worthy as the stores and styling you’ve come to know and love. Why must you go right now? The space is seriously decked out for the holidays. You can come for brunch and stay for holiday shopping and one of many seasonal workshops and events being hosted here right now. Imagine calling up your closest and insinuating Sunday brunch is soldiering on despite the seasonal stress. You’ll entice them with the perfect prospect of doing a little holiday shopping at the nursery and home & garden store, Terrain, after fortifying themselves with fresh, local fare and cool conversation. What they won’t know, until they set foot on site, is just how swiftly they’ll sink into the very spirit embodied by this elegant edifice. Seasonal stress, schmeasonal mess – this beautiful home & garden store and subsequent greenhouse café evokes a much slower and sweeter pace of life, inviting you to sit down, slow down and get down where every single gathering is gorgeous and meaningful. Sounds like just our kind of spot. The antique greenhouse seems to shine like a Christmas tree due to the perfectly placed string lights suspended from the glass-paned roof. They emit a gorgeous glow that bathes anything and everything around it in a soft amber light. 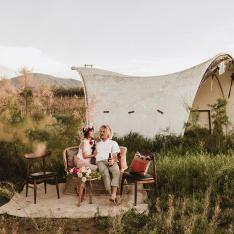 The lush greenery seems to grow wildly, but therein lies the rub – it’s well-intentioned and thoughtful, a perfect accent to the raw wood tables set simply with soft, burlap napkins. The translucency of the glass mixed with the suspended greenery delight the senses into thinking everything is magically floating in thin air. The entirety of the space is evocative of what the Terrain brand does so well –mixing luxurious indoor with outdoor, thoughtfully-designed home & gorgeous garden with layer upon layer of texture. The antique greenhouse plus the softly glowing string lights, rough hewn wood tables and fabulous, hanging flora set the stage for a beautiful brunch gathering any day of the week. With a place as gorgeous as this antique greenhouse, the hope is the food will be equally as satisfying and seasonal. Styer’s Café does not disappoint. 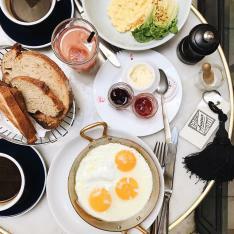 In fact, we’d say the commitment is real – brunch is served every, single day and the presentation is just as pretty as the food is fresh and local. The tables are set with finely woven burlap napkins, mason jars and stoneware mugs. It’s humble yet heart-warming and as always the devil is in the details. Every meal starts with a mouth-wateringly warm loaf of baked bread served in a flowerpot and topped with creamy, luscious lavender salted butter. We’re currently craving the artisanal cheese plate to share. It’s served family style on a rustic tree round and styled as beautifully as one of their in-store product presentations. The portions are generous and the cheeses & accompaniments like fresh honey, sweet golden raisins, quince paste, pickled onions, whole-grain mustard, and strawberry- are thoughtful and paired perfectly. The buttermilk blueberry pancakes with vanilla whipped cream and local, real maple syrup, beckons. Although if you’re looking for something more on the savory side, try the truffle polenta pizza with a perfectly poached egg on top. To. Die. For. Finish off with a fabulous cobbler served in sweet and small cast iron pan. If you've been saving that bottle of bubbly for a special occasion, we suggest you BYOB it and they'll pop that bottle for you for and make fresh-as-can-be mimosas! Come for the Brunch Stay for The Events! Cozying up around one of these wood feasting tables with your friends, digging into farm fresh fare and fabulous conversation underneath the glowing lights of an antique greenhouse will ensure a magical and much-needed brunch. On your way out, be sure to wander through the Terrain shop, we're just about guaranteeing you'll finish off that holiday shopping list - for your loved ones and yourself. December 17th: Make a day of it! Do a late brunch, hang out and lounge around for the day. Starting at 6:00 there is a 'Holiday Shopping and Cocktail Event' - shop the selection of good-natured holiday gifts as you sip cocktails featuring their favorite small-batch mixers from Belvoir! December 19th: Sleep in on Saturday, roll out of bed and head to brunch with your bests. Then starting at noon, there is a Ria. B Jewelry Trunkshow. Pick out the perfect gift or treat yourself to something special! December 19th: After you have fun at the Ria B. Trunkshow, linger even longer for the 'Fireside Treats' event! Take a moment to warm up by the fire as you enjoy s’mores and more favorite winter treats. December 20th: Head to brunch with your crew. Starting at 11:00 you cannot miss the incredible 'Planted Holiday Centerpiece Workshop'! Just in time for Christmas feasts, create a one-of-a-kind, planted centerpiece to complete your holiday table. Craft your festive display with their favorite seasonal finds and expert guidance from the décor specialist. Reservations are required. $20 per person including materials. December 26th: Head to a post-Christmas brunch and stay for the last 'Fireside Treats' event of the year! Do we dare say, after this long and festively fun day, that brunch turns into dinner?! Tis' the season for whilsting the day away, and why not laze around before entering 2016? If there is ever a month to do it, December is certainly it! We vote that you stay at Styers. Shall we meet you there? 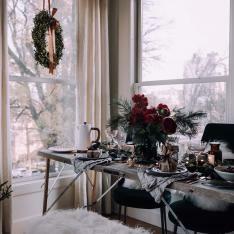 Visit Shop Terrain, Glen Mills for more information on the brunch along with their holiday event offerings. For information on hosting holiday private events or weddings in the greenhouse visit the Terrain Venue Profile.